Providing you the best range of construction film, vapor bar, construction geo membrane and concrete curing film with effective & timely delivery. We are an eminent name, which is engaged in delivering Construction Film to honorable clients. The offered range of construction films is made utilizing high grade raw material and modern machinery in strict compliance with the international quality standards. Moreover, the offered range of construction films is appreciated for its reliable performance and high efficiency. We are offering an excellent quality of Vapor Bar. The vapor bars are generally, laying, welding, repairing and protection of under slab vapor barrier lining for preventing the penetration through the slab of damaging alkaline salts, moisture, mold, radon gas and water vapor. The Vapor bar are smooth, uniform in colour, texture & finish, free from pin holes, un dispersed raw material, streaks & particles of foreign matter, no other visible defect such as melt fracture, holes, tears or blisters. 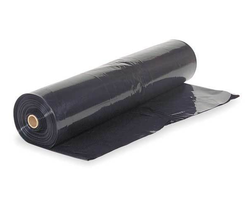 Available in 200,400,500 or more micron thick 100% virgin quality HDPE LDPE synthetic vapor barrier. 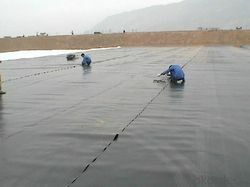 Length of the liner should be 50.0 mt or more and width should be 6.0 mt. 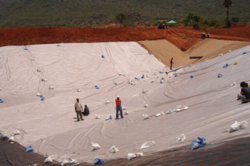 We are among the prestigious organizations engaged in supplying a quality range of Construction Geo Membrane. These Construction Geo Membranes are manufactured by using premium quality material and following the established standards of the industry. All these products are supervised by a team of experts, in order to maintain higher quality standards and eliminate flaws, if any. Post procurement, our experts examine these product on different parameters to ensure their flawlessness. We are a reckoned enterprise, which is engaged in delivering Concrete Curing Film to the clients. The offered range of concrete curing films is made utilizing optimum grade raw material and innovative technology in strict conformation with the international quality norms and standards. Along with this, the offered range of concrete curing films is ideally utilized for curing concrete.